Below are camping Dutch ovens (and some for indoor use) and related items for sale on Amazon and eBay. 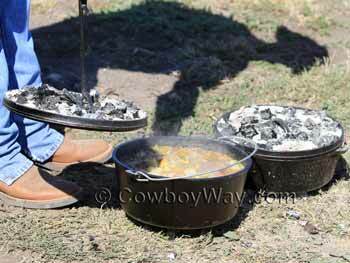 Dutch ovens are a favorite type of cookware for cooking with a campfire or fireplace. There is a difference between camping Dutch ovens and Dutch ovens for indoor use! If you don't know the difference please scroll down for good information to know before buying a Dutch oven. 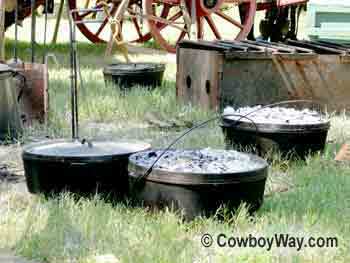 Below: Two camping Dutch ovens with legs, lids designed to hold coals, and bail handles. Is it really a Dutch oven? Some people refer to any large pot as a Dutch oven, but it might not be the same thing you're looking for. Is it really a camping Dutch oven (designed for use with a campfire or fireplace)? Sometimes indoor Dutch ovens (designed to be used with an indoor stove) show up in the items shown above; make sure you're looking at the kind of Dutch oven you want. Does it come with a lid? Lids aren't always included, so read the item's description to be sure. Below: Three Dutch ovens, two with hot coals on their lids. 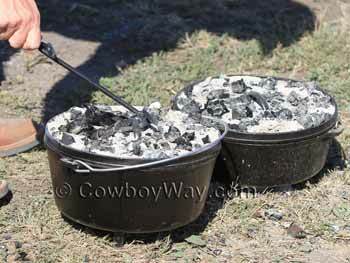 Not all Dutch ovens are designed to be used with a campfire or coals. Will be of heavier construction. Will have a lids with a ridge or lip around the edge designed to hold hot coals. Will have legs (instead of a flat bottom) to keep the oven off the ground so heat from coals can circulate underneath it. Will have a bail handle. A "bail" is a style of handle that forms a loop, extending upwards in an arc from one side of the Dutch oven to the other side. Below: Two camping Dutch ovens. Will have a domed or other style lid that is not designed to hold hot coals on its top. Usually have a flat bottom instead of legs. May or may not have a bail handle. How big is the Dutch oven? If it's round, you'll probably want to know how wide it is across (diameter), or how far it is around (circumference) and also how tall or deep it is. Some sellers may also simply give the oven's capacity in quarts. If the oven is oval, you'll probably want to know its length, width, and height, or its' capacity. What is the Dutch oven made of? Dutch ovens are commonly assumed to be made of cast iron, but they can be made from a wide variety of materials. Since cast iron and aluminum are two of the most common materials, we've compared a few of their differences below. Aluminum - Aluminum is much lighter than cast iron. For example, a 12" aluminum Dutch oven typically weighs around 7 pounds, while a 12" cast iron Dutch oven usually weighs around 20 pounds. If weight is a factor (such as for packing, canoeing, etc.) then an aluminum Dutch oven may be your best choice. Aluminum is also easier to care for than cast iron. Aluminum doesn't rust (cast iron can, unless it's taken care of properly) and you can wash aluminum with soap (most fans of cast iron will not use soap on their Dutch ovens). However, aluminum has its drawback. Aluminum does not retain heat as well as cast iron, and does not distribute heat as well. Aluminum also reacts more quickly to temperature changes (it's quicker to heat up and cool down) so cooking outdoors with an aluminum Dutch oven on a windy day can make it much more difficult for the oven to achieve and maintain an even temperature. Cast Iron - Cast iron is the traditional choice for a Dutch oven. Cast iron reacts more slowly to temperature changes than aluminum, which means it's harder to burn food in a cast iron Dutch oven compared to an aluminum one. Cast iron also retains heat well, so it will take fewer coals from a campfire to bring the food inside the oven to the desired temperature. Also, once a cast iron Dutch oven has been removed from heat it will keep cooked food warmer longer. Cast iron's slow reaction to temperature changes and its heat retention also mean it will cook food more evenly and predictably outdoors in windy conditions than aluminum will. In addition, cast iron flavors foods in a way that most people prefer over aluminum. Cast iron's drawbacks include its heavy weight, and its ability to rust unless properly cared for (which is usually done by wiping a light coat of oil or shortening over it after each use). Cast iron is also not as easy to clean after cooking as aluminum (most cast iron cooks consider soap and water on their cast iron Dutch ovens to be forbidden). In addition, new cast iron must be "cured" or "seasoned" (which is usually done by heating the oven while it's coated with some type of oil or shortening and allowing the oil to seep into the metal) before its first use. However, some makers of cast iron Dutch ovens manufacture new ovens that come ready to use and don't require seasoning. Note: The Dutch ovens for sale on Amazon on this page might be made from something other than aluminum or cast iron. Read the item's description carefully to know what the oven is made of. How much will the shipping be? Dutch ovens can be heavy. Make sure you know how much the shipping charges are going to be. If you find a Dutch oven on Amazon you like but you're not ready to purchase it right away, you can always add it to your shopping cart so it will be easy to find later. In most cases, Amazon will keep track of your Dutch oven, and anything else in your shopping cart, for 90 days. Important: Putting a Dutch oven in your Amazon shopping cart or "Save for later" list does NOT reserve it! It just makes it easier to find if it's still in stock when you come back.